Brachiaria brizantha and Brachiaria decumbens are closely related and very similar morphologically, which has led to incorrect identifications (Miles et al., 1996). Bread grass (Brachiaria brizantha (Hochst. ex A. Rich.) Stapf) is a tufted perennial grass, usually 60-120 cm high (up to 200 cm), with deep roots (down to 2 m) and short rhizomes. It has stout, erect or slightly decumbent culms and bright green leaves. Inflorescence is a panicle consisting of 2-16 racemes, 4-20 cm long. 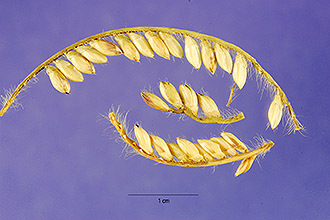 Spikelets are usually on a single row, elliptical, 4-6 mm long with a sub-apical fringe of long purplish hairs. Brachiaria brizantha is very variable in habit, leafiness, hairiness and yield. It is similar to Brachiaria decumbens, though a little more tufted and with slightly different spikelets and shorter roots (Cook et al., 2005; FAO, 2010; Göhl, 1982; Husson et al., 2008). Brachiaria decumbens cv. Basilisk is now considered to be Brachiaria brizantha (FAO, 2016). Brachiaria brizantha makes an excellent multi-purpose and productive pasture that can withstand high stocking rates with good persistence under continuous or rotational grazing. 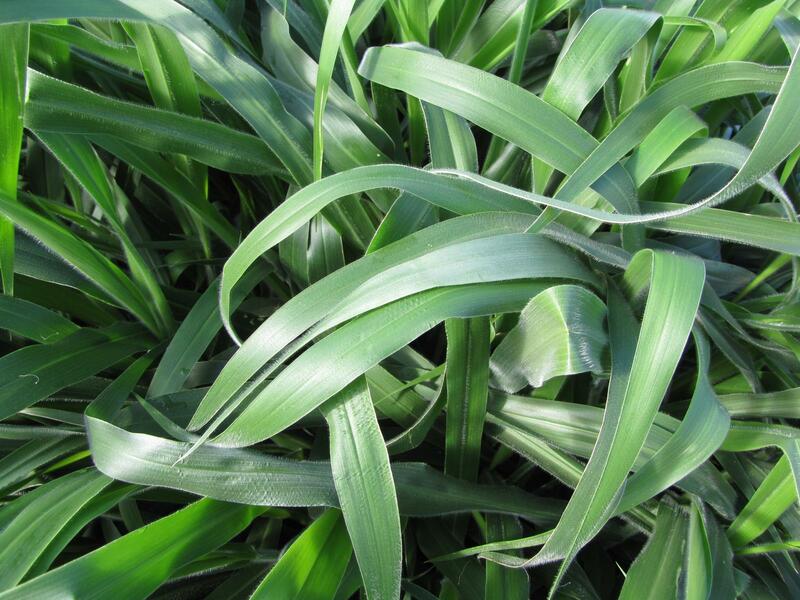 Bread grass is also valuable for cut-and-carry feeding, hay and silage (Cook et al., 2005). It is also grown as ornamental hedges and for erosion control (Ecocrop, 2010). Several commercial varieties have been developed. Brachiaria brizantha is native to tropical Sub-Saharan Africa from 25ºS to 12ºN, and is now widely naturalised in the humid and sub-humid tropics, where its natural habitat are grassland valleys and open woodlands. It is a warm-season grass for the lowlands, from sea level up to an altitude of 2000 m in the tropics, and up to 1000 m in higher latitudes. Optimum temperature for growth is about 30-35°C. The leaves are frost-sensitive, but the plant survives light frost. Brachiaria brizantha grows best with 1500-3500 mm average annual rainfall, though it tolerates less than 1000 mm rainfall and can withstand dry seasons of 3-6 months during which it remains green, unlike other tropical grasses. It is more productive under light shade, particularly when soil N is low. It is a suitable grass in coastal regions where it combines with coconut (Anken-Lagefoged, 1955). It can grow on a wide range of soils: light to heavy textures, with a wide range of soil nutrients and a pH 4-8. However, production increases as soil nutrients increase. Flood tolerance is generally poor, depending on the variety (Cook et al., 2005; FAO, 2010). Brachiaria brizantha can be heavily grazed if used as a mono-specific sward with regular top dressings of N. Both Brachiaria brizantha alone or in combination with Congo grass (Brachiaria ruziziensis) are considered as improved forages and recommended to farmers in South America (Payan et al., 2007). Other grasses such as Brachiaria humidicola or Brachiaria dictyoneura, and, under more intensive grazing systems, creeping legumes such as Arachis spp., Desmodium heterocarpon subsp. ovalifolium, Stylosanthes spp., Alysicarpus vaginalis, Leucaena leucocephala, Pueraria phaseoloides, Desmodium intortum can be mixed with Brachiaria brizantha (Cook et al., 2005). In cut-and-carry systems, N fertilizer should be applied after each cut for maximum production. If grown with a legume the grazing system must favour the legume and adequate P must be maintained (Fredericksen et al., 1980). Dry matter yields range from 8 to 20 t/ha/year, depending on soil moisture and nutrients. Pastures can be permanent (up to 20 years without replanting) or planted under crops such as rubber and coconut. Brachiaria brizantha has been used successfully as ground cover for erosion control in Australia and India. It performs quite well without fertilizer and was found to be one of the best grasses under low levels of N and P in Colombia. Brachiaria brizantha suppresses weeds thanks to its fast growth rate (FAO, 2010; Husson et al., 2008; Cook et al., 2005). When it is used as an intercrop, it reduces the yields of upland rice and soybean (the latter by 40-50%) (Cook et al., 2005). In the vegetative state, Brachiaria brizantha contains about 10% protein in the DM and 66% NDF. 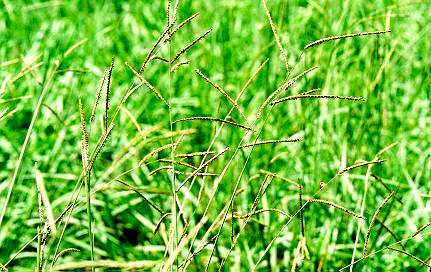 The crude protein range of Brachiaria brizantha is quite large, from 5 to 16% DM. Mineral content is about 7-13% DM (Feedipedia, 2012). Brachiaria brizantha declines in nutritive value as it matures, as shown in the table below. Brachiaria brizantha, like other Brachiaria species, can cause a sporadic toxicity syndrome of hepatogenous photosensitivity. Sheep, goats and cattle develop skin lesions, facial oedema, liver damage (larger quantity of foamy macrophages in the hepatic parenchyma), mesenteric lymph nodes and ruminal stasis that result in severe drops in weight gain (down 40%) and possibly death if the animals are not removed from the pasture (Moreira et al., 2009). Poisoning has been reported with sheep grazing bread grass in Australia and Brazil (FAO, 2010; Lascano et al., 1996). The cause of toxicity appears to be the presence in the bile ducts and hepatocytes of crystals of salts of sapogenin glucuronides originating from steroidal saponins present in the plant. Sapogenins content varies according to environmental stress, plant age and developmental stage. Outbreaks of Brachiaria spp. poisoning in central western Brazil are frequently observed in pastures that had not been grazed for more than 30 days. They also occur during the growing stage of the pastures at the start of the rainy season (Brum et al., 2009). As with other Brachiaria species, Brachiaria brizantha is of high nutritive value. In countries where Brachiaria spp. has been well managed as a forage crop, standard agronomic practices have resulted in very impressive animal performance (Urio et al., 1988). The mean in vivo organic matter digestibility (OMD) obtained on 25 samples of Brachiaria species was 57.8 ± 9.2% (range 40-77%). It corresponds to a ME content of 8.0 ± 1.7 MJ/kg DM (range 4.6-11.7). Addition of fertilizer may also have an effect on chemical composition and nutritive value as shown in the table below. Brachiaria brizantha is well accepted by grazing livestock. It is considered to be slightly more palatable than Brachiaria decumbens though slightly less digestible. Most of the trials have been carried out in Brazil. Frequent light grazing of Brachiaria brizantha results in a high proportion of nutritious leaf material in the diet of cattle (Trindade et al., 2007). Reduced grazing time may be compensated by higher bite rates to regulate total forage intake (Zanine et al., 2007). A low herbage allowance (5 kg herbage /100 kg live weight) is advisable for cattle grazing Brachiaria brizantha in a rotational grazing system, since the sward is sensitive to overgrazing (Braga et al., 2006). Brachiaria brizantha can support variable growth rate, ranging from 290 kg/ha/year to 924 kg/ha/year, depending on the season, stocking rate or association with other crops, as shown in the table below. In an agroforestry system of Costa Rica, Brachiaria brizantha sown under high (27% of the area), medium (14%) and low (7%) tree cover and grazed by Brahman heifers resulted in higher growth rate (+13-14%) under the heaviest cover. During the dry season, heifers under high tree cover lost less weight (Restrepo-Saenz et al., 2006). Supplementing young grazing bulls with 0.5 kg/day of concentrate resulted in a better economic outcome but they did not achieve the appropriate slaughter weight (Brito et al., 2008). Increasing the level of concentrate in fattening crossbred Nelore steers grazing Brachiaria brizantha pasture had a positive influence on daily live weight gain. Supplementation is therefore technically and economically viable, with better results at a level of 0.76% of body weight (Baiao et al., 2005). With Santa Gertrudis and Simmental breeds the best results were obtained with a supplement of 0.125% live weight, with an efficiency rate of 1.62 (Goes et al., 2005a). Increasing the concentrate level up to 0.6% of live weight increased daily weight gains linearly, but the best economical return was obtained at 0.4% live weight (Leao et al., 2005). Maize and soybean meal supplementation (24% crude protein) provided higher values of weight gain at 0.5 and 1.0% live weight and higher efficiencies at 0.125 and 0.25% LW (Goes et al., 2005b). Energy and protein supplementation during the rainy season results in a greater profit margin (Barbosa et al., 2008). In Nellore-Blonde d'Aquitaine crossbred steers, supplementation increased animal weight gain from 0.77 to 1.06 kg/day/animal (Fernandes et al., 2010). Due to its low crude protein content, Brachiaria brizantha has to be supplemented with protein-rich concentrates or with urea. Supplementation with increasing urea levels showed a quadratic response to total DM intake and DM intake from pasture, with the best response at 1.6% urea (diet as fed) (Acedo et al., 2007). Weight gains of 0.5-0.6 kg/day could be obtained using only maize grain, urea and a mineral mix in multiple supplements for finishing beef cattle (Sales et al., 2008). Supplementation with protein sources provided viable economic returns, regardless of the protein source evaluated in relation to the control group (Porto et al., 2009). The supplementation frequency of steers on Brachiaria brizantha pasture did not affect the forage DM intake, total diet DM intake and DM degradability (Morais, 2009). Moreover, reducing supplementation frequency may decrease feeding and labour costs with no influence on steer performance during the dry season (Canesin et al., 2007; Goes et al., 2005a). There are few published data on the use of Bracharia brizantha for milk production. Supplementation with an energy-protein concentrate in lactating cows fed with Bracharia brizantha during the beginning of the dry season was beneficial to the performance of calves and cows (Sampaio et al., 2010). Though Bracharia brizantha silage may result in low nutrient intake and thus lower animal performance, it may be a valuable alternative as a forage source in beef cattle diets. Its optimal use depends on the appropriate integration of pasture management and forage surplus conservation in the form of silage (Pereira et al., 2008). A bread grass/sorghum silage ratio of 67:33 fed to Nelore steers resulted in similar intake and body weight gains compared to the diet containing only sorghum silage (Chizzotti et al., 2005). In 12-24 month Santa Ines sheep grazing Brachiara brizantha, average daily gain was greater with animals that also received Desmodium heterocarpon subsp. ovalifolium hay (Magalhaes et al., 2005). Bread grass hay can be combined with tree foliage. Moringa (Moringa oleifera) foliage included as a protein supplement to bread grass hay-based diet fed to dairy cattle increased DM intake and digestibility of the diet as well as milk production without affecting milk composition (Sanchez et al., 2006). Brachiaria brizantha is used as green forage by farmers to feed rabbits, notably in Indonesia and in several West African countries (Raharjo et al., 1986; Lebas, 2007). It is also distributed ad libitum as hay to provide fibre in addition to a concentrate in some experimental studies (Eekeren et al., 1991; Thayalini et al., 2000). But the nutritive value of this forage is very low, due to a low protein level and a very high fibre level. Nevertheless it could be pointed out that this small quantity of protein is balanced in lysine and sulphur-containing amino acids (Lebas, 2013), but the contribution of Brachiaria brizantha to fulfil rabbit's requirements in amino acids remains quite negligible as a consequence of the low protein content and of their low digestibility (Raharjo et al., 1986). The digestible energy content could be compared to that of a cereal straw, i.e. 2.9 MJ/kg DM (Raharjo et al., 1986; Raharjo et al., 1988). When distributed as green forage alone or in addition to a concentrate, the spontaneous feed intake is lower than that of most of the other forages in comparative studies (Raharjo et al., 1988). For all these reasons Brachiaria brizantha could be used safely in rabbit feeding, but exclusively as source of fibre. In balanced diets, it could be introduced at up to 20% of the feed (Gomes, 2013). Bianchin, I., 1991. Epidemiologia e controle de helmintos gastrintestinais em bezerros a partir da desmama, em pastagem melhorada, em clima tropical do Brasil. Tese (Doutorado) - Universidade Federal Rural do Rio de Janeiro, Rio de Janeiro, 162 p.
Lourenço, A. J. ; Leme, P. R. ; Marcelo de Queiroz, M., 2001. Animal performance on Brachiaria brizantha alone or supplemented with concentrate or protein bank of Leucaena leucocephala. XIX Congreso Internacional de Pastos. Edición en formato electrónico. Sociedade Brasileira de Zootecnia. Sao Pedro. Sao Paulo, Brasil.